Bon vivant, railroad historian, photographer, pioneering food critic, chronicler of New York's caf society, and noted newspaperman, Lucius Beebe (1902-1966) was an American original. In 1938, with the publication of High Iron: A Book of Trains, he transformed the world of railroad-subject photography forever by inventing the railroad picture book genre. In 1940, he met creative and life partner Charles Clegg (1916-1979), also a talented photographer. Beebe and Clegg produced an outstanding and diverse portfolio of mid-twentieth century railroad-subject photographs. Beebe, sometimes with Clegg, also authored about forty books, including many focused on railroads and railroading. 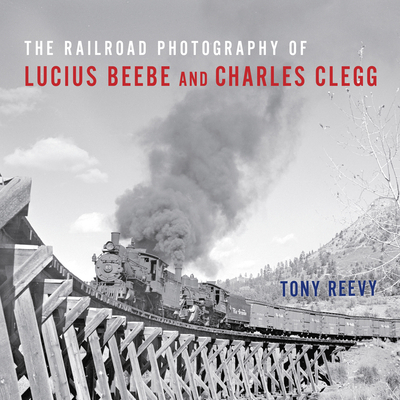 The Railroad Photography of Lucius Beebe and Charles Clegg brings their incredible story and best photographic work together. Providing an extensive biographic introduction to Beebe and Clegg, author Tony Reevy presents a multi-faceted view of the railroad industry that will appeal to rail enthusiasts as well as those interested in American food culture, the history of New York City, and LGBT studies. The Railroad Photography of Lucius Beebe and Charles Clegg is an indispensable history to the work of two men who forever changed the way we see and experience American railroads. Tony Reevy has written several books, including The Railroad Photography of Jack Delano and O. Winston Link: Life Along the Line, in addition to poetry and short fiction. He is Senior Associate Director of the Institute for the Environment at the University of North Carolina at Chapel Hill. He resides in Durham, North Carolina.